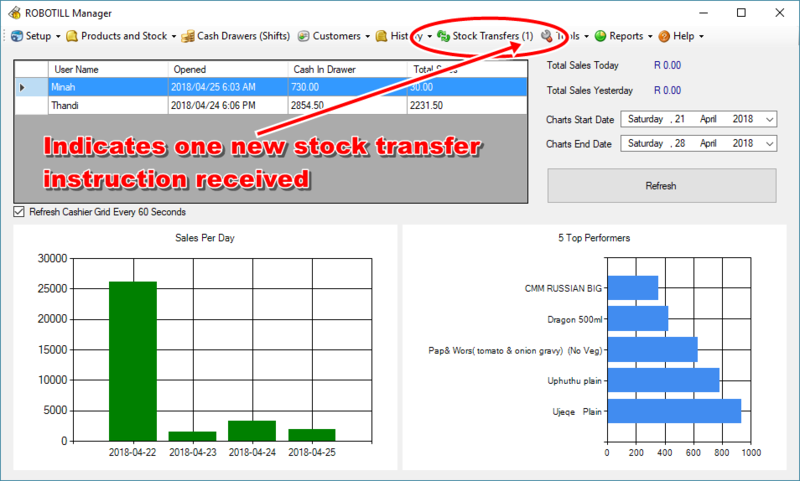 You can remotely transfer stock from one branch to another. To do this a transfer instruction is created that is then automatically sent tot he dispatching branch and the receiving branch. In ROBOTILL Branch Module select 'Stock Transfers' and click on 'Add New Transfer'. 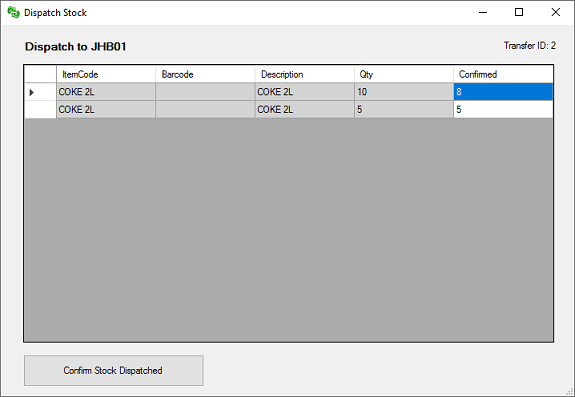 Select the branch from where you will dispatch the stock and the branch that will receive the stock. You can add the items one by one by scanning them or typing the codes. You could also add multiple items by searching for them using the 'Add multiple' button. You can then enter the number of items to transfer for each product in the grid. Once you are done, click on 'Transfer Stock'. The transfer instructions will then immediately be sent to the branches. A new transfer instruction will be created that will allow you to view the detail of the instruction as well as the progress. 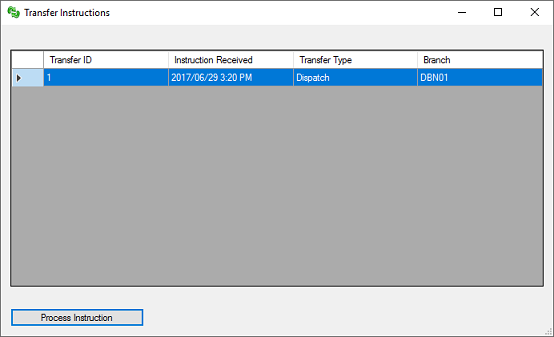 Each branch (the receiving branch and the dispatching branch) will automatically receive the transfer instruction. 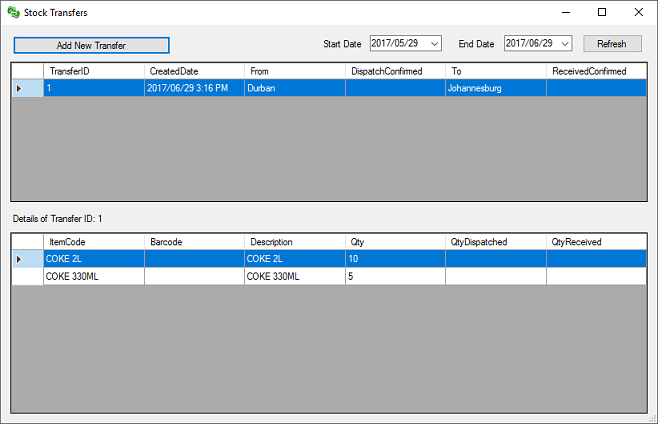 In ROBOTILL Manager the 'Stock Transfers' menu item will indicate that there is a new instructions that should be processed. To see what was received, simply click on the 'Stock Transfer' menu item. The dispatching branch will receive a 'Dispatch Instruction' and the receiving branch will receive the 'Receive Instruction'. When the dispatching branch clicks on 'Process Instruction' they will be instructed what to dispatch and how many. They will also be able to indicate how many was actually dispatched (in case the required amount is not available). When they click on 'Confirmed Dispatched' the stock quantities at the branch will be updated (the stock dispatched will be deducted). A confirmation will automatically be sent to the head office to indicate the date and time dispatched as well as the actual quantities dispatched. In the same way the receiving branch, when the actual stock is received, can process the transfer instruction. In ROBOTILL Manager click on Branch > Stock Transfers and select the instruction. The receiving branch can then enter the actual amounts received (in case some 'fell off the truck'). Again the head office will automatically receive confirmation of the stock received and stock quantities (stock on hand) will be updated. In the branch module all transfer instructions can be monitored to see when stock was dispatched and received as well as actual quantities dispatched and received.